RoboBlue wrote: If anyone comes across either that or Numbermaze, please let me know. ...There is on this more modern looking version. 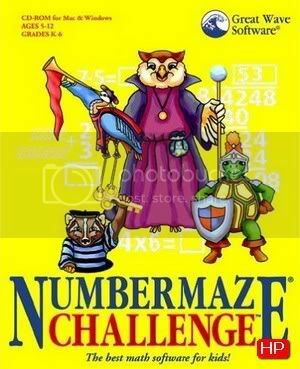 No, numbermaze is a windows game that I don't remember much about, but I remember there were parts with...whoa, I found it on rapidshare while I was searching for an image! When you lose or quit (I cant remember) a voice would say "Your Despicable". Perhaps a Loony Tunes game? I kinda remember what you're talking about - not a loony tunes game though. HOWEVER if we are thinking of different things, is it this: http://www.answers.com/topic/looney-tunes-space-race-1 ? That's the only reputable source Google threw up! kuliwil wrote: I kinda remember what you're talking about - not a loony tunes game though. No, I remember playing the game on PC. it wasn't one of those boxing-type games was it? kuliwil wrote: it wasn't one of those boxing-type games was it? No, I wasnt into fighting games. I'm also looking for a racing game I played on PlayStation 1 a couple of times. It involved miniature characters with various appearances, though I can only somewhat clearly remember one of them, who had a cap and a gasmask/speaker combination as a face. The characters ran on the race tracks without using vehicles, and could use different weapons to slow down or temporaly stop others (I remember the levels themselves might've had traps or obstacles as well, like moving trains on rails). Because they were literally the size of ants, the levels ranged from a child's room (with bunch of toys scattered around) to the roof of a waxed car (this one was super-hard because of the sliperiness). Lastly, the name of the game was propably something like "Microracers" or "Miniracers". I think the title only had a single, compound word. Grimson wrote: I'm also looking for a racing game I played on PlayStation 1 a couple of times. It involved miniature characters with various appearances, though I can only somewhat clearly remember one of them, who had a cap and a gasmask/speaker combination as a face. There was a Micromachines Racing game, though I don't know there was one for PS1 (Megadrive Version). Good work bumping this thread, now we have TWO active "Lost games"-threads. To be fair, this thread never left the first page. I recommend you to try Death Rally or Mad Cars. RoboBlue wrote: To be fair, this thread never left the first page.